Have you heard people say – I treat my daughter like a son? Contrary to popular opinion, that’s not a parenting best practice. It’s unconscious gender bias. Not convinced? Read on. If you are not an Indian, the above statements may sound odd. However, if you are an Indian, you have heard this over and over again. Many of us (Indians) will not find anything wrong with the above statements. Mostly because the ones who have heard it repeatedly, have been conditioned to believe that this is either a compliment (to the child) or a parenting best practice. To an extent, I agree with this, because this is almost always meant in a good way. However, sometimes we need to take a step back and think about what we mean to say versus what is the implied meaning of what we are saying. What is meant: I love my daughter, and I don’t believe in gender bias. What is implied: Having a son is awesome. Having a daughter is not quite at the top of the awesome scale. But, hey I am all about equality, and she is as awesome as my son. Note: Son being the standard for awesome here. It is like saying, this carrot is so awesome, it’s almost like a cupcake (can you tell I am bad at examples?). This is a compliment to the carrot. It tries to elevate the carrot to something more desirable like a cupcake. I am just saying that it is enough to be a carrot. You can be a good carrot without being a cupcake, or like a cupcake (Okay – this sounds weird, but you get the point). Still not convinced that there is something fundamentally wrong with the above statements? Here is some food for thought. Have you heard anyone say? My son is awesome. He is such an IDEAL son. Also, when you say my daughter sings like Lata Mangeshkar (top Indian singer) or my son plays like Sachin Tendulkar (everyone knows him- well okay not EVERYONE *wink wink* ) – THAT is a totally acceptable comparison. Here, you are essentially trying to attribute superior qualities of those people to your child. However, a child, just by being a son does not become superior or have superior qualities. All I am trying to say is: A daughter is good enough. She does not need to be like a son. She does not need to be like anything or anyone. She is good enough being who and what she is. We all mean well, we really do. 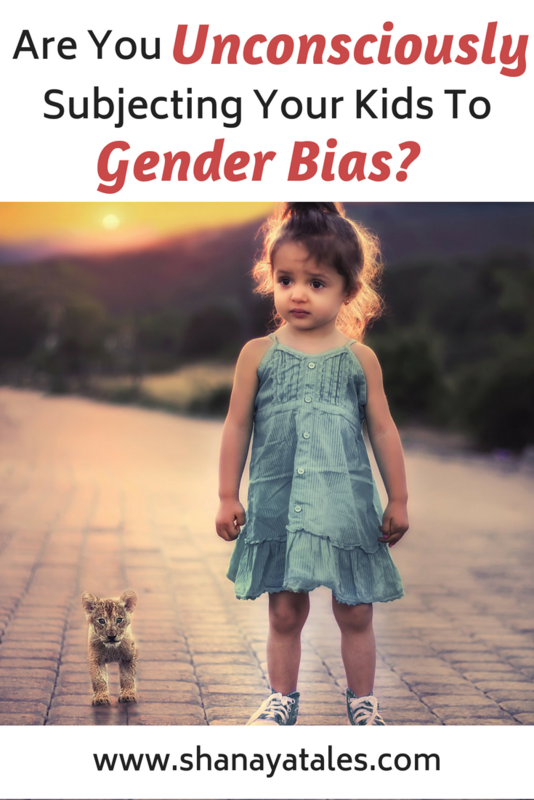 Let’s just try and make a conscious decision to avoid all forms of gender bias, in our actions and our speech (explicitly or implied) as that will be the next generation’s standard. If we all work towards it, I am sure we can make it happen! *Linking this post to International Women’s Day #Makeithappen Link Up 2015 and Blog-A-Rhythm. Yes Prathima, some things are ingrained so deeply in us, that we do not question the logic behind it- especially things that are said in a positive (?!) way. Excellent post. I love how you explain your points. Happy Women’s Day to you and may we see that change – won’t happen overnight but someday we will see that shift. Liked the fact that you wished the awesome men too, we do have them in our lives and they are with us in our efforts to make it happen. Great example of carrot and the cupcake, loved it. Happy Women’s Day to you too. Thank you so much, Sulekha 🙂 Yep, like you said, they are our partners in our efforts to make it happen. I added that, just to assure them that we love & appreciate them equally. Excellent way you explained,what I see that whole world’s community not only indian community driven by male from ancient times. it will take long time to change the mentality of human because these things are ingrained so deeply.I hope that it will change but we will not be there to see the change. Good post, I am happy to be visiting your blog. I think the onus to change things around lies upon each one of us. India’s social psyche has always been about a gradual change without any outer outrage. Every society suffers from many different prejudices, biases. I lived for a decade and a half in the US, can’t tell you how many anti-girl-child biases I saw/heard about in the average American psyche. Meaningless social license to behave like boys in bars and nightclubs doesn’t really solve anything. Each society has to figure out how to get rid of social inequality and raise its children in an equitable way that allows each child, regardless of gender or any other social identity, to blossom fully to his/her potential. True! Treat your daughter as your daughter…why treat her like a son? Is being a daughter any less ? Not at all ! She is born a daughter for a reason. There is no need to treat her any different. 🙂 Thank you so much for stopping by, Naba. Loved your post. I have heard these statements as a teenage but back then it never struck me to question or at least wonder why is a son considered to be a benchmark for a girl ? Your post definitely made me correct the meaning of the comparison in my head and see to it that I never say such statements to my baby girl. Great going ! You made so much sense there. Many times people make statements without understanding their implications. This thing about girls and boys irks me no end. Wish we could just forget to compare and contrast them and accept them for what they are. * A daughter is good enough. She does not need to be like a son. WIsh people begin thinking like that …they will be doing their daughters a world of good! you explained it so well!! Love the way you gave the example, no you are not bad at it! 😛 On a serious note, I wish everyone could understand that a Son is not honorable term to be given to any daughter. If she is good, she is good in her own way, why compare and belittle her achievements!! You mirror my thoughts exactly. Loved the way you put it *Son is not honorable term to be given to any daughter. Excellent Shantala.. This reminds me of the commercial in which a couple – where the guy is at home & the lady is the sole earner. Their friend after knowing this comments “So you r the man of the house?” The lady aptly answers – “Even better…I am the WOMAN of the house”. here you’ll see even the husband is proud of his wife. We’ve come a long way now from the time where women were not considered worth comparing..so now we’re in the stage where ppl r making conscious effort to show tht they’re fine with having daughters or tht they treat their daughters equally or like sons. what u say here is the future where daughters will be only DAUGHTERS & not like sons keeping their individuality. Keep writing such wonderful posts. I lost count how many people have actually told me there’s nothing girlish in me rather than the fact that I am born as a girl. I never understood why girls cannot be just girls and like a son. Loved your post. Every parent, should read this and should let their daughter to be a daughter rather than bring her up like a son. I have been hearing for years, that no behavior or character in me is like a girl rather than the fact that I am born as girl. It’s hightime family bring up a daughter as a daughter itself. But in our society daughters are considered weak or soft and cannot handle the men’s world alone. First that should be changed. Loved your post. Powerful and much needed one. Excellent post. Gender bias has seeped so deep in our society, that we are incapable of making a compliment without being chauvinist. I remember being not too happy as a child, when my mother sometimes referred to me as “like her daughter”, for being a good and empathetic listener, even if it was meant to be a compliment. I found it necessary to qualify the “as a child” bit, since I am neither as empathetic, nor as much a chauvinist anymore; well, you win some, you lose some. Excellent post, Shantala. Loved the carrot cupcake example. It doesn’t matter whether we have sons or daughters.we just have to concentrate on raising them as good kids. I think many times people make these statements without really understanding the larger significance of these words. In their opinion, they are actually complimenting or stating an aberration to a social fact. As awareness spreads, they will realize their folly. Nicely written. I’ve always felt annoyed when people make that comment, but I never realized why it was so irritating. Your comments are apt. Great post about men-women equality. And I agree with you there. Sometimes those comments said with all positive intent indicate something else.. Loved your take for Women’s Day. And what you’ve written is thought provoking. I never thought that way, and now I won’t make that mistake. The analogies that you’ve brought out are amazing..!! Shanaya Tales recently posted…On Reading Goals – 3 things to keep in mind while setting reading goals. Loved the post. You mirrored my thoughts completely. This is my favourite topic and I can go on and on discussing about it. I agree with all the examples you have given here. And I have one more to add. Whenever a girl is born in a family, people especially the elders make it a point to drop in habitually – “these days girls and boys are all equal (aajkal ladka ladki sab barabar hain)”. It is a very decent thought on gender equality but delving deeper you know they are convincing who else but themselves of this fact. I wrote a somewhat related post ‘Raising a boy like a boy’ a few months back. There is a hue and cry on social media that if we raise our sons like our daughters we can achieve gender equality. The question to be asked here is will doing so is going to help? Why not raise our children as just humans without the differentiation? Will certainly check your post out. Shantala much as we would like to bring up our children without a gender bias, let me narrate a personal experience- in my family of distinct female dominance , my two year old grandson who sees his mom go to work alongside his dad ( they are both doctors) and sees his paterna grandparents too work as a doctor team, sees me drive , drink (while my husband doesn’t) shocked me the other day when he said that girls can’t drive and girls can’t drink. So I asked him how come I could do it – he said you’re not a girl you’re an Ajji! Much as we may beat our chests and shout ourswlv a hoarse there will always be a difference Brugge sexes and as the French say vive la difference! I totally acknowledge the differences, and completely agree with you. We each have our own unique strengths. The only thing I am against is preconceived notions and biases bases on the gender.